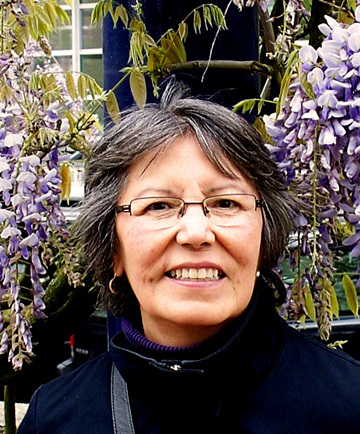 Freda Ahenakew was born on the Ahtahkakoop Reserve, a direct descendent of Ahtahkakoop’s brother, Ahenakew. She received some of her early education at the Sandy Lake Day School, but she absorbed a great deal more sitting at the knee of her father’s brother, Canon Edward Ahenakew, an ordained Anglican priest and gifted storyteller around whom the whole family gathered to listen at every opportunity. She moved to the Muskeg Lake Reserve as a young woman when she married into the Greyeyes family. When some of her twelve children began to drop out of school, Freda Ahenakew decided to lead by example, and began to ride the school bus with them each day. 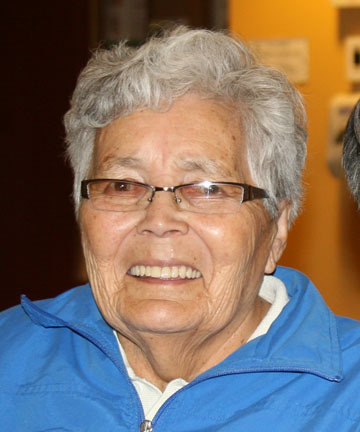 As she continued her education, her quiet but inspirational attitude helped spread her passion for Cree language and culture wherever she went. Jean Okimâsis was born Jean Lillian Littlechief to parents Dawson and Lillian (née Still) of White Bear First Nation in southeastern Saskatchewan. She received her elementary education on Reserve before completing high school at the Lebret Residential School. After raising two adopted children and anchoring a successful farm family at Little Black Bear First Nation, Jean pursued a degree in Psychology at the University of Regina. During her studies, she rediscovered a pride in her first language, Cree, and joined the late Dr Ahab Spence in 1982 in the fledgling Languages program at the Saskatchewan Indian Federated College (SIFC; now First Nations University of Canada). Her own work, and collaboration with her student Solomon Ratt, quickly lead to the publication of Cree, Language of the Plains, a language instructional set of textbook, workbook and audio tapes, available from SIFC in many editions and printings through the 1980s and 1990s. These materials were republished in 1999 by the Canadian Plains Research Center, with a major revision of the textbook completed in 2004. Jean’s books and CDs are currently used in Cree language programs throughout western Canada. At SIFC, Jean was a driving force behind the establishment of the Department of Indian Languages, Literatures, and Linguistics, which she served as first department head (1985-1988), and for a second term before her retirement from teaching (in 2002). She also contributed greatly to the creation of the first and only full degree programs in First Nations languages (Cree and Saulteaux (Ojibway)) in Canada. Other accomplishments include her work on two First Nations language curricula, her constant participation in the Saskatchewan Cree Language Retention Committee, and numerous contributions to Cree language literacy through instruction and editing.